Newcastle have completed the signing of Yoshinori Muto on a four-year deal after the Japan international was granted a work permit. Muto had to wait on an FA Governing Body Endorsement (GBE) hearing to find out whether he can complete his £9.5m move to Newcastle. He did not meet the automatic criteria for an FA GBE, having not played enough international matches for Japan in recent seasons. The 26-year-old agreed personal terms and completed a medical last Friday ahead of a permanent switch from German club Mainz. Muto said he was "honoured" to become Newcastle's first Japanese player, though, after his deal was confirmed once his case was heard by an Exceptions Panel. "I am really looking forward to playing in front of the fans," he said. "I hope to achieve good results - that is what I am here to do. I would like to perform well and leave my name in Newcastle's history." 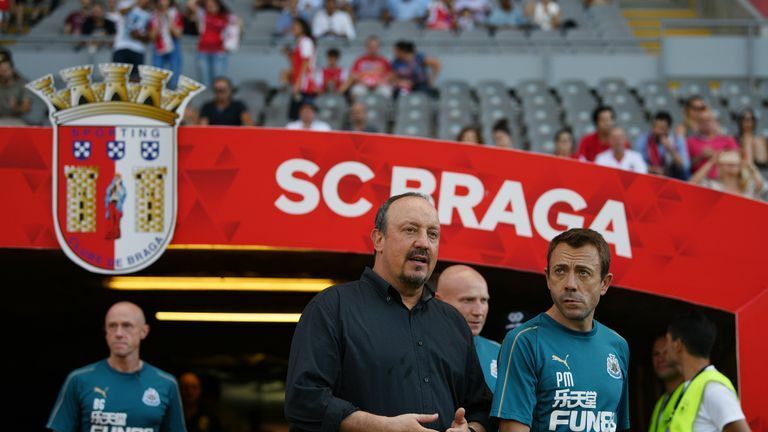 Manager Rafa Benitez confirmed the club had been tracking Muto for some time before the forward became the club's fifth signing of the summer. Benitez said on Wednesday he had "no idea" what transfers Newcastle would complete before the window closes on August 9. Newcastle sold striker Aleksandar Mitrovic to Premier League rivals Fulham last week for £22m, but Salomon Rondon's proposed move from West Brom has stalled as the two clubs are struggling to find an agreement, Sky Sports News understands. Speaking of Muto, Benitez said: "Hopefully he can bring us his energy and work-rate and help the team to improve and be better for the new season."